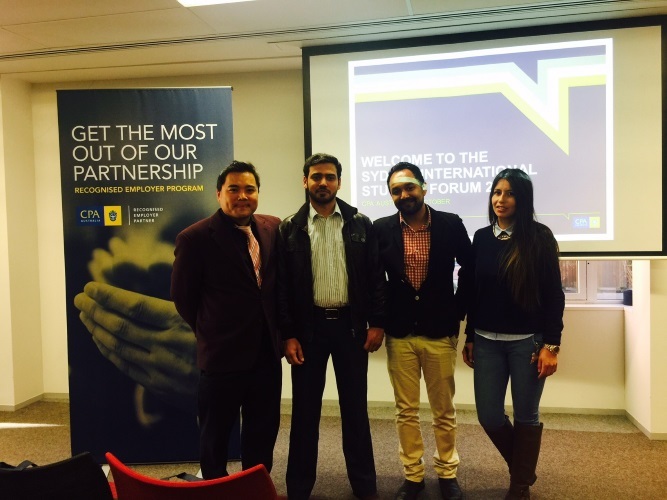 As part of the ongoing engagement with external industry leaders and ongoing professional development Elite students were invited to the International Students Forum at CPA Australia in Sydney. Dr. Paul Howe led a group of students to the event. The CPA International Students Forum offered Elite students fantastic insights into building a professional career after graduation. Speakers on the night included Peter Mackey, the Director of StudyNSW in the NSW Premiers Cabinet. Peter explained the support given to international students in terms of employability and developing a career from the State government. Elite students were invited to participate in “Interchange 3.0”, a program to boost international students’ entrepreneurial skills and employability and “Intersective – NSW Global Scope” initiative which will give 400 NSW International students (including those at Elite) to gain meaningful work experience across 11 NSW government agencies, NGOs and private sector companies. Dr Paul Howe will lead these ongoing initiatives at Elite in collaboration with Peter and the NSW government. Students also had the chance to meet the CEO of Performance Education, Owen Firth. Owen gave an inspiring talk on how to overcome challenges for international students in gaining a successful career after graduation. The 4 challenges he outlined were “communication skills”, “gaining relevant work experience”, “culture adaptability” and “gaining a competitive advantage in the recruitment process”. After the event students were invited to cocktail and canapés with Owen where he shared his thoughts on entrepreneurship and starting your own business – and how entrepreneurship can be a very rewarding path for international students.